WE2XRH looks like an Amateur radio call sign but it is actually the call sign of an experimental short wave station in Alaska. Transmitting DRM on 4.85 MHz, 7.505 MHz and 9.295 MHz with a Near Vertical Incident Skywave antenna system, they hope to cover all of Alaska and almost nowhere else with shortwave broadcast. The company told FCC that its initial tests would be funded by and conducted for the Defense’s Joint Electromagnetic Technologies program, a classified operation whose mission is to develop technologies for use by special forces and intelligence units. Defense also will supply surplus transmitters from the closed, Cold War-era Over the Horizon Radar, located in Delta Junction. The radar system bounced shortwave signals off the ionosphere to detect aerial targets, such as Soviet bombers, at ranges up to 1,800 miles. The transmitters are 100 KW Continental HF units, which for this applications are running about 20 KW. According to this Yahoo Groups posting, several Japanese shortwave DXers have received the station in late 2009, but nothing recently. I shot an e-mail off to their information address, but did not receive a reply. On High Frequency (HF) NVIS has been used for several years where line of sight VHF communications are not possible. Soldiers during the Vietnam war noticed that if a vertical whip was bent over so that it was horizontal to the ground, the signal strength was slightly less but the signals were much less prone to fading. In this case, WE2XRH is using a crossed dipole antenna which generates a circularly polarized field. With traditional HF skywave, polarization is not a factor since the ionosphere usually causes some field rotation anyway. It is interesting that the system had this design consideration. The NVIS is a novel approach and it may work on Medium Frequency (MF) during the night time, but daytime coverage would still have to rely on ground wave signal. The FCC has historically approached MF skywave as a secondary and unreliable transmission method. The idea being to reduce the antenna take off angle to as low as possible, hence the popularity of taller than 90 degree towers. There is good validity to that practice as mixing the ground wave and skywave components at a receive antenna will cause multipath fading. 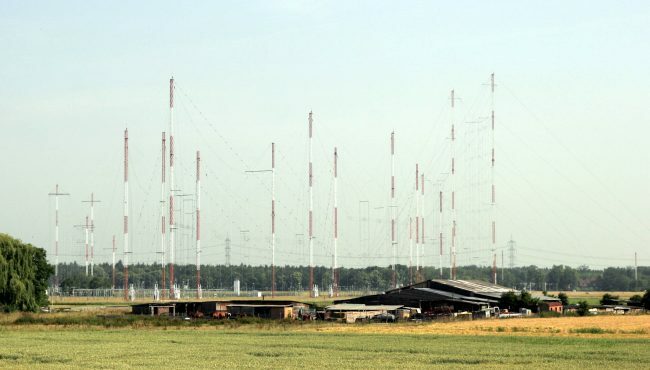 Setting aside a new broadcasting frequency segment, say 1.6 – 1.8 Mhz, a system could be designed to transmit DRM by using groundwave during the day with a traditional 90 degree tower, and NVIS at night with a horizontal dipole antenna. Then never the two should meet. The night time NVIS system would have a small ground wave component, out to a couple of miles. In addition to that, the night time NVIS system can run on an adaptive power system, when propagation conditions are poor, more power can be applied to the antenna input and in better conditions, power reduced in accordance with a remote receive monitor that reports the Bit Error Rate (BER) back to the transmitter controller. The best NVIS antenna is the 1/2 wave dipole positioned between 0.1 and 0.2 wave lengths above ground. In the 1.6 to 1.8 MHz band, that equates a half wave dipole antenna 260 to 292 feet long mounted between 66 to 90 feet above ground level. This would have many advantages over the current directional antenna based MF broadcasting system currently deployed. The current system is based on pushing potential harmful signals away from a station that was licensed to the same frequency (or an adjacent frequency) earlier. This puts the onus for proper operation on the broadcast license holder. Most don’t have the know how or resources to insure that a n AM directional is operating properly. I would estimate at least half of the directional AM antennas in this country are out of tolerance. 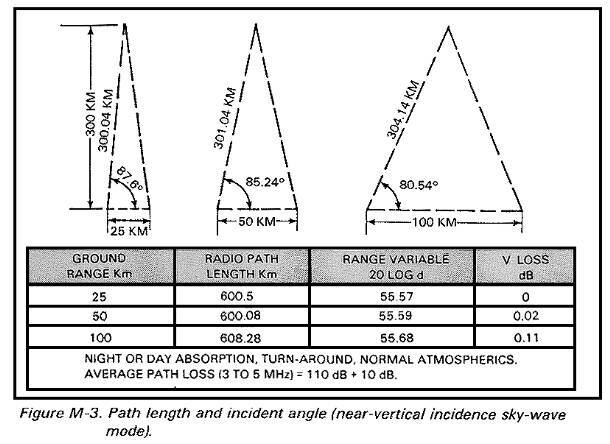 With a NVIS based night time antenna system, coverage areas would be assigned much like an FM allotment. The BBC conducted medium wave DRM tests in 2007 with satisfactory results during the daytime, but poor reception at night time due to co channel interference. That is why DRM will not work on the current AM broadcast band and if digital radio is to be broadcast on MF, a new frequency band would be needed. Digital Radio Mondiale, an alternative to HD radio? Could be. 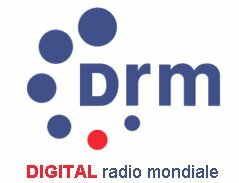 Digital Radio Mondiale, or DRM, is a modulation scheme that a group of broadcasters and transmitter manufactures have been working on since about 1997 or so. There are numerous shortwave broadcasters; the BBC, the CBC, Deutsche Welle, Radio France Internationale, the VOA, and others have been using DRM on shortwave for several years now. I can state that the shortwave DRM system works well, I have a software decoder and use the sound card input on my computer to decode and listen to DRM shortwave broadcasts. The goal of DRM is to establish a world wide open standard for digital broadcasting in the LF, MF, HF, and VHF bands. 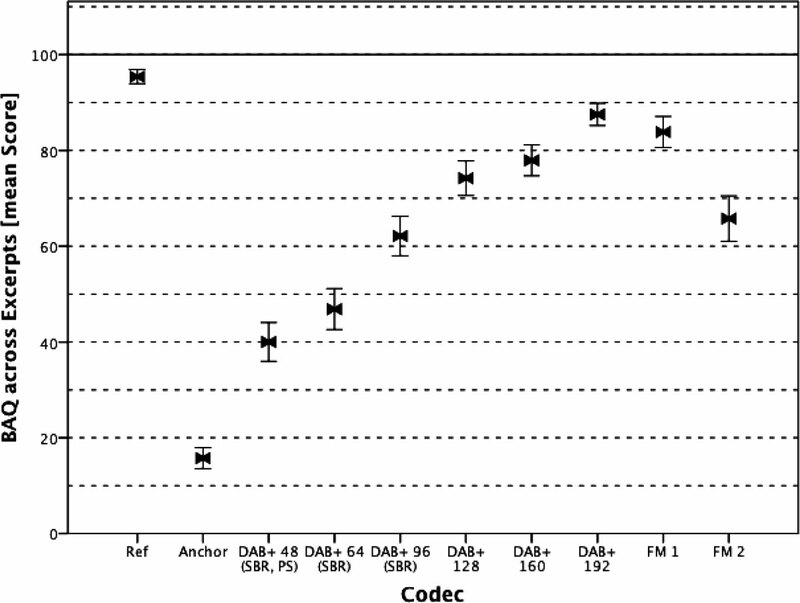 In the early years of development, DRM was designed for digital broadcasting on the bands below 30 MHz. This system is now known as DRM30. Since then, the DRM consortium has expanded that to the VHF band (up to 174 MHz) as well (meaning where the current FM band is located) and have called that system DRM+. 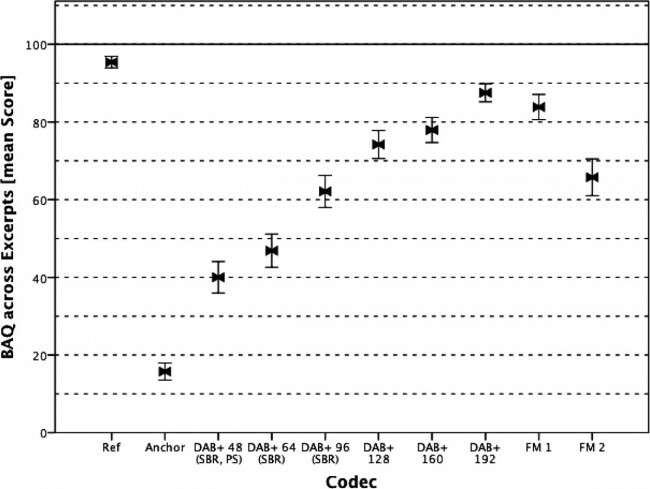 DRM uses COFDM (Coded Orthogonal Frequency Division Multiplex) modulation, which is the same as IBOC HD radioTM. This is a robust modulation system that employs multiple carriers at lower power (than an analog carrier) spread across the entire alloted bandwidth. One of the claims is DRM transmits less power and is more energy efficient. In general, digital radio modulation does transmit less power, that is true. However, transmitters have to be run more linear for digital due to the increased bandwidth. This may not translate to greatly increased efficiency from the AC mains to RF standpoint. Because of that, there is more waste heat, and thus more air conditioning is needed to cool the transmitter room. Open source system. Royalties are paid by the transmitter manufactures only (and do date, most major US transmitter manufactures have already paid these). There is no royalties paid by the broadcaster to install DRM or by the consumer when purchasing a DRM capable receiver. One company does not own the rights to the modulation system for all the broadcasters in the country. Universally standard; accepted by the European Telecommunications Standards Institute (ETSI), International Electrotechnical Committee (IEC), and the International Telecommunications Union’s (ITU). The CODEC is HE-AAC 4, which is widely used world wide. DRM30 and DRM+ fits into existing band plans and will not interfere with other users on adjacent channels. DRM30 is designed for 9 KHz channel spacing and DRM+ is designed for 100 KHZ channel spacing, all of which comply with existing FCC regulations. Standardized receiver profiles, things that must be included in all DRM receivers. There are several advanced options as well, such as a media rich system that includes video. DRM+ has several added features: DRM text, which is similiar to RBDS. EPG or electronic programming guide, which shows what is coming up next and a searchable schedule of when programs may be heard out to seven days. Some DRM+ receivers will have a TIVO like recording device that allows the user to record programs and play back later. In addition to that, DRM30 station have the ability to transmit low frame rate H. 264 video. This is a distinct advantage for short wave stations that are seeking a way around fire wall blocking. The video image is small, 176 x 144 pixels, and it is 8 frames per second, which is about as good as can be expected using a 9 KHz channel. In some cases, DRM is capable of a hybrid mode (ed note: DRM calls this “Simulcast mode”), but what have we learned about hybrid mode digital radio: It doesn’t work very well. In short, it would be better if DRM were employed in the digital only mode. To many, this is a distinct disadvantage, but I don’t see it that way. There have been many that have made the IBOC roll out/FM broadcasting roll out annology. Frankly, those arguments don’t hold water. When FM was introduced, no attempt was made to shoe horn it into the existing AM (Standard Broadcast) band, it was not designed to interfere with other stations or itself, power levels were sufficient for good reception using existing technology, quality over AM was markedly improved and programming was often separate (simulcasting with existing AMs did not start until later). My point here is that any digital broadcasting should be introduced on a separate set of frequencies. Some have proposed using TV channels 5 and 6, which makes some good sense. Whatever the outcome is, we have learned, the hard and expensive way, that hybrid digital broadcasting does not work well. A brief video about DRM30. It is possible to operate DRM in a hybrid mode on the AM band and occupy the same bandwidth as HD radioTM (30 Khz), it might also be possible to squeeze that down to 20 KHz. Most modern (read: solid state) AM broadcast transmitters should be able to transmit DRM without modification (antenna systems may be a different matter). It might be fun to apply for an experimental license to broadcast somewhere in the 1600-1700 KHz range with DRM30 only and no analog modulation, except for an hourly station ID in morse. A 1/4 wave tower in the middle of that band would be 141 feet tall. With use of a skirt, a grounded tower can be employed. That and a few above ground radials and the system would likely be pretty efficient. Part of the experiment would include driving around and taking signal strength readings while recording the programming material. This would give some real world testing on how the system would perform in wide spread use. Of course, this would require a major about face by the FCC, which is not likely unless someone there grows or somehow acquires a back bone. Some people question the need to do any type of digital broadcasting. I am a realist, in one way, shape, or form, digital radio broadcasting will (or already is) take(ing) place. It would make the most sense if the best system were used, which is not necessarily the first system proposed. The big question is, will today’s terrestrial broadcasters be involved, or out of business.